This photo was taken by our 3 year old. Thanks for not dropping the camera! Here's a shot of the Sunday class. 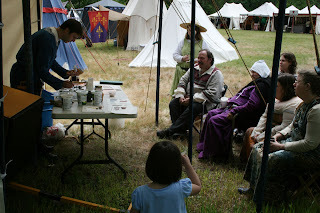 As I briefly mentioned, last weekend we were in Eugene at Egil’s, a SCA event. I had a great time sharing what I’ve learned so far with other attendees. I’ve already gotten an email from someone who has attended my class with some suggestions on things to try. Thanks! The Craftsman Handbook by Cennio Cenni – translated by Daniel Thompson. 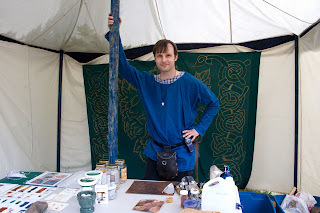 Also by Daniel Thompson: The Materials and Techniques of Medieval Painting. Glass Buttes in Central Oregon near Riley. Apparently there is a lot of obsidian there of which I could make some good tools. A note to visit the Newgrange Megalithic Passage Tomb in Ireland. Just a quick note, with more details to follow. 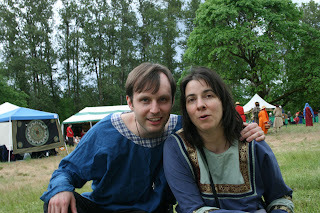 My wife and I spent our Memorial Day weekend at Egil's 34, a SCA event (from their webpage: The SCA is an international organization dedicated to researching and re-creating the arts and skills of pre-17th-century Europe). I had the opportunity to 'teach' two classes on making pigment from scratch. It was really more of a chance to share what we all have learned about how our ancestors made pigment. I certainly learned a lot from everyone, and a good time was had by all! Photos and resource links will be posted shortly (tons of books and ideas were passed around). Thanks again to everyone who attended!